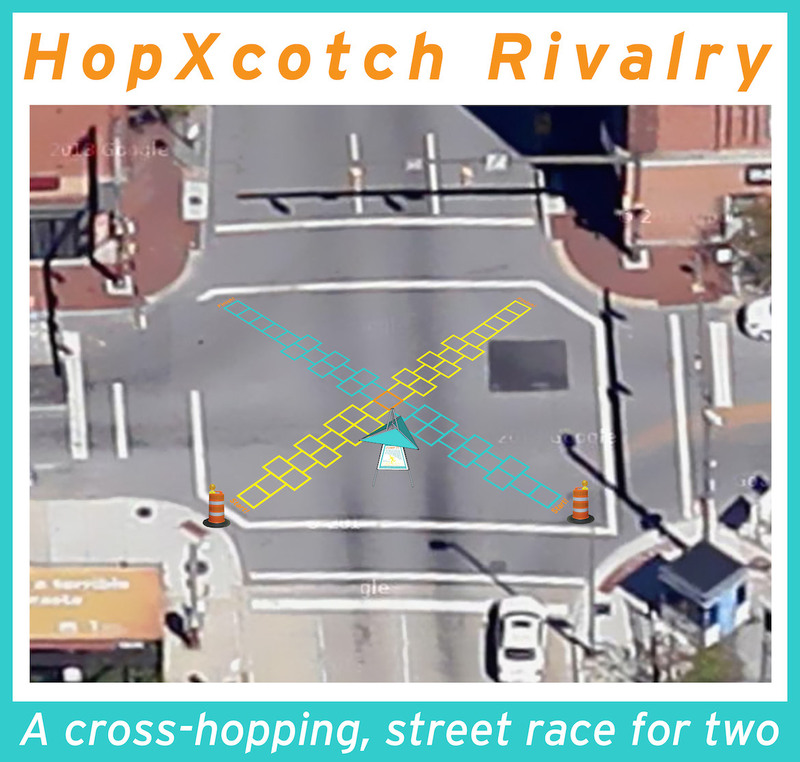 HopXcotch Rivalry is two extreme hopscotch courses crossing for one action packed, two person race! Inspired by the success of the Hopscotch Crosswalks in downtown Baltimore, this new project brings playful pedestrian action to the middle of Artscape’s Field Day programing along Charles Street. Participants start at competing ends of the hopscotch paths and must jump fast while staying on track. The two 50’ long courses meet at the middle, presenting an opportunity for racers to bump each other off course. Play in official tournaments or organize your own race at any time! Check back for organized hopscotch tournaments at scheduled times throughout the Artscape weekend. Stand at “Start!”, begin at whistle. Hop one-footed at single squares, two-footed at double squares. Bumping passersby prohibited. Wait while balancing until path is clear. Loss of balance, jumping out of bounds or bumping a passerby results in restarting at beginning. Win a tournament, wear a CHAMP button! Throughout Artscape weekend HopXcotch Rivalry referees will be organizing tournaments. Tournament champs are invited to sign the “Wall of Winners”, snap a selfie and then tweet the photo to @grahamprojects! Tournament winners will also win an official HopXcotch Rivalry CHAMP button. Want know about other Graham Projects events and the forthcoming SiteLines walking tour schedule? Subscribe to Graham Projects updates! FIELD DAY and Artscape are programs of the Baltimore Office of Promotion & The Arts, Inc. (BOPA).